Found 11 canvas vintage canvas sacks at an estate sale. Happy dance. Washed them, dried outside on a sunny day. 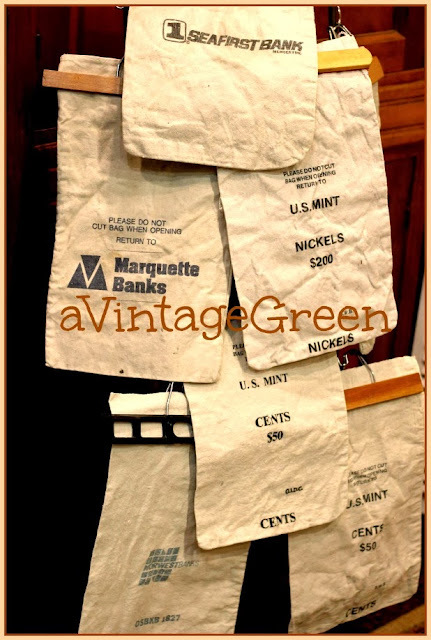 7 were vintage with lettered coin bags, 4 were plain vintage canvas bags. Hung the sacks that had bank type words on pant hangers. They will be in my booth at VAM. The 4 plain canvas sacks had possibilities. 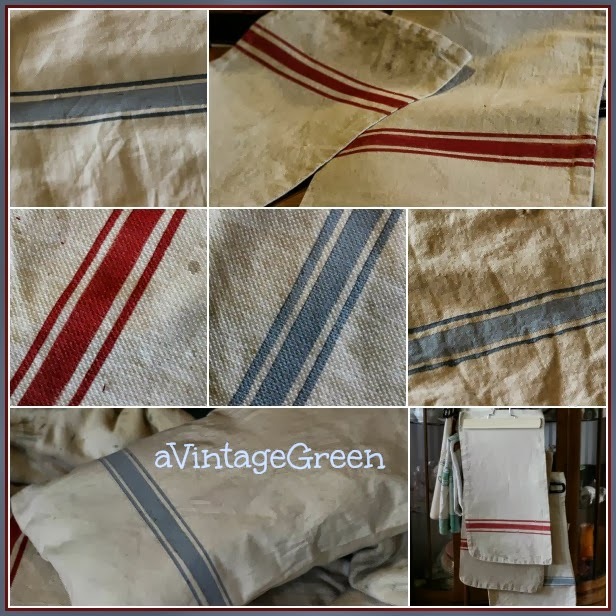 After all my grain sack envy I thought, why not PAINT stripes on them so I can have the faux german/french/homemade grain sacks look. First I tried out the painting stripes on my canvas drop cloth. I learned a bit about how much paint to use and the best way to tape/paint the stripes. So, tutorial follows. 1. Place the 2 pieces of yellow tape spaced for wide stripe, make sure the tape edges are very tight to the cloth (press with finger along edge, make sure the contact between tape and canvas is tight (note I chose a space that was LESS than the width of the tape, works well for step 3). 2. Paint space between tape. Remove tape right away (discard) Pull tape straight back. Wait for the paint to dry. 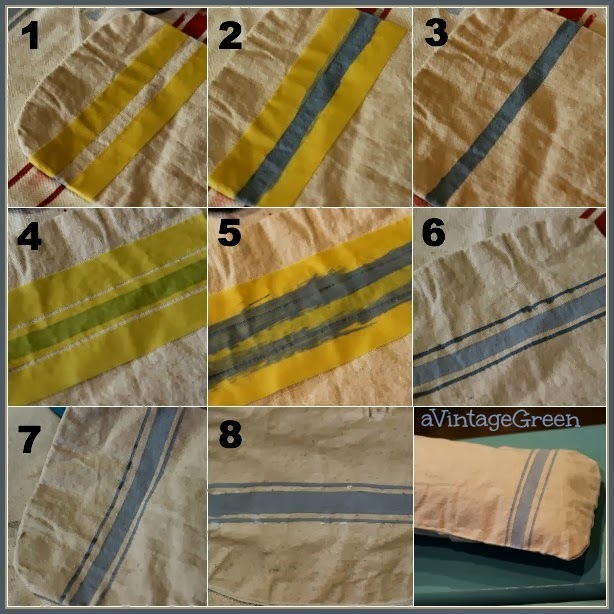 Here is the sequence (again) that I used for painting, this time using a rougher canvas bag surface that was not as flat, (should have steam ironed it first). I stuffed the sacks to show how they would look as small cushions. 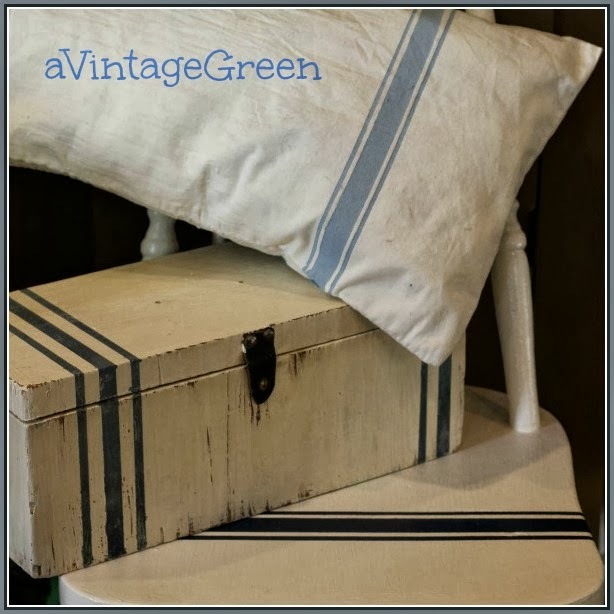 One of the faux grain sack painted canvas sacks is displayed below on my painted faux grain sack painted chair (faux painted wooden box here).This painted striped cushion fabric was a smoother painting surface. 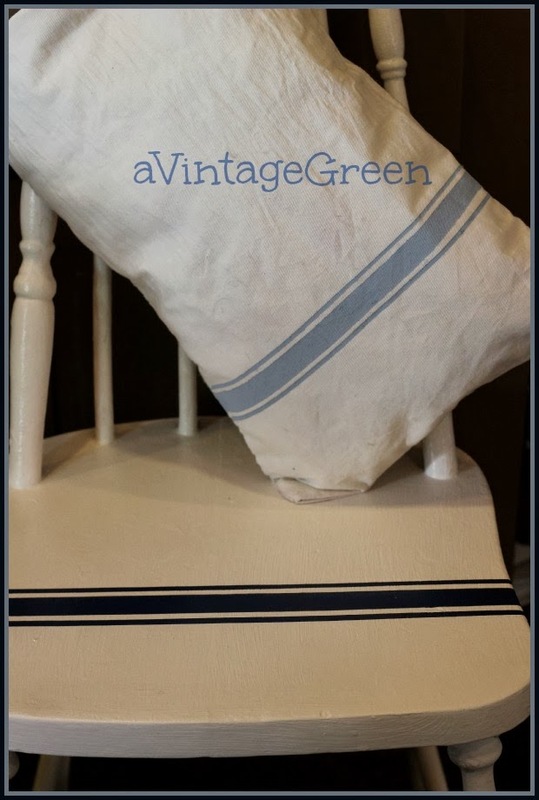 I am seeing more faux grain sack striped dressers, benches, side tables, chair seats on Pinterest. I love the look and had a great time painting the stripes. Thanks for visiting. Leave a comment and I will visit your blog too. Thank you Kathy@A Delightsome Life for the feature. 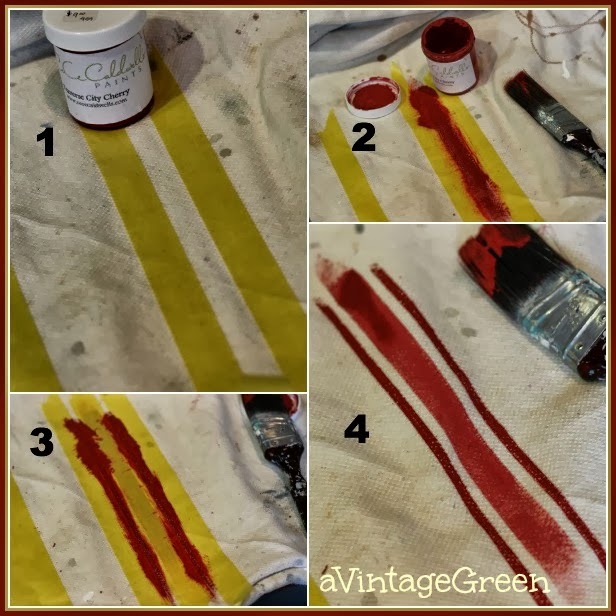 Wonderful tutorial, great upcycling and your painting is flawless! Very creative! Those sacks are looking great! Great tutorial Joy! I'm going to be on the lookout for grain sacks... wait... I might have one in the old trunk upstairs. Yipee! ( another project on my list... thanks a lot) Just kidding. I love that look and it would make great looking pillow covers for the family room. It's so fun to make something useful out of an article that's just laying around. Thanks for sharing such a fun project! Your directions are great. This was a great idea. I am crazy over feedsacks, floursacks, grainsacks...oh you get my point. Awesome tutorial Joy - I definitely want to try this sometime. I found you over at the Junkin Joes Party and am definitely adding you to my G+ Circles! What a fabulous idea! I've been brooding over those for a while. Now you've shown me an economical way to get the look I love! Thanks for sharing this great tutorial. I love the grain sacks but especially love how you painted that chair. Cheers! Great find on the canvas bags. Love the way you displayed the bank bags. but the grain sack painting idea is so clever. Thanks for the how-to. These are really beautiful! I know I should learn to do something like this! I sure love the look of them! Hugs! fabulous idea! and thanks for the tutorial - though I doubt I would be able to paint cloth as neatly as you! I have some printed flour sacks which I love for lining bread baskets etc. Very clever and thank you for the tutorial! Visiting from Mary's Mosaic Monday. LOVE your grain sacks and the chair!! Great tutorial; thank you. Thanks for the wonderful idea and tutorial. I can't wait to try this out. These are great...and I am so going to steal this idea for a grain sack that I have that doesn't have stripes. As a matter of fact I have some coffee burlap sacks that I might even add a stripe or two to. Thanks for the inspiration! I love grain sacks Joy, and now I know what to do with them. Great tutorial! Those turned out wonderfully, Joy...the sacks were a great find! Now I have grain sack envy! ;) Yours turned out great! Thanks so much for linking them up at the DIY Sunday Showcase. They turned out great, Joy! What a great find, too. Great tutorial Joy! pinning it. Those sacks were wonderful finds, you did a fabulous job, thanks for sharing! Joy what a great project! It looks wonderful. Thanx for partying at THT! Cute--and I love the box it's on too! Great job, love them! Thanks so much for sharing at AMAZE ME MONDAY! I love this IDEA!! I need to try this I have painted a drop cloth before and LOVED it!! I would love for you to come link up to my Furniture and Paint Party going on NOW!!! This is FABULOUS! I have been wanting to do this on some canvas pillows so thank you so much for the tutorial! LOVE THEM!!!! What a wonderful idea. Occasionally I find things like this at yard sales, want them but don't know what to do with them. They would look great in the kitchen or laundry room like this. Thank you, brilliant!! Great tutorial. 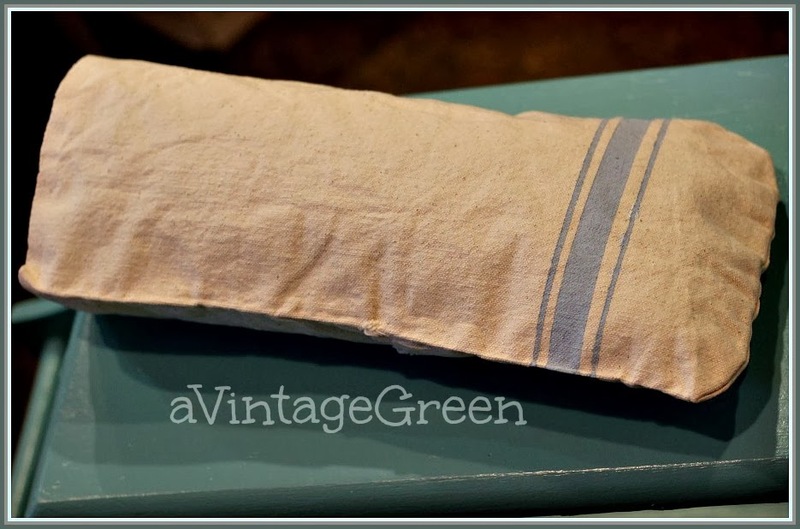 A lovely accent pillow. Thank you for sharing at the Thursday Favorite Things Blog Hop Hugs! Great tutorial! I'm featuring them in this week's PoPP Spotlight. Love your project ... very good tutorials. I have not had much luck with painting stripes, so this will help. Congrats on all the features ... well deserved.